I think I’m hoping for warm weather; I keep finding myself drawn to sunny weather recipes like fish tacos and now these prawn tacos. We were having a lazy Saturday recovering from all the snow and I finally got to watch the food network for a minute. Rick Bayless was on and he was eating these tacos in Veracruz. They looked fabulous and surprisingly easy. This is a definite crowd pleaser, very flavorful and not too spicy to eat. Round up the tequila and the prawns and get chopping! -Roast garlic by placing whole, in skin, in a small frying pan and put on medium heat. Roast, turning occasionally until skin is browned in places and garlic is softened, about 15 minutes. Let cool and peel. -Make pico de gallo first while the garlic roasts so the flavors have time to meld. Combine tomatoes, onions, cilantro, jalapeno, lime juice and salt and pepper and set aside. -Put the 1/2 can tomatoes, the chipotles and the roasted garlic into a blender and puree until mostly smooth. -Put 3 tbsp olive oil in a large fry pan and heat over medium-high for 2 minutes. Add puree-it should sizzle-and cook for a minute or so. Add the crema or creme fraiche, the oregano and the salt and stir until combined. Cook for 3 minutes or so and then add the prawns. Stir and cook for 3-5 minutes until the prawns are just cooked and lose their transparency. 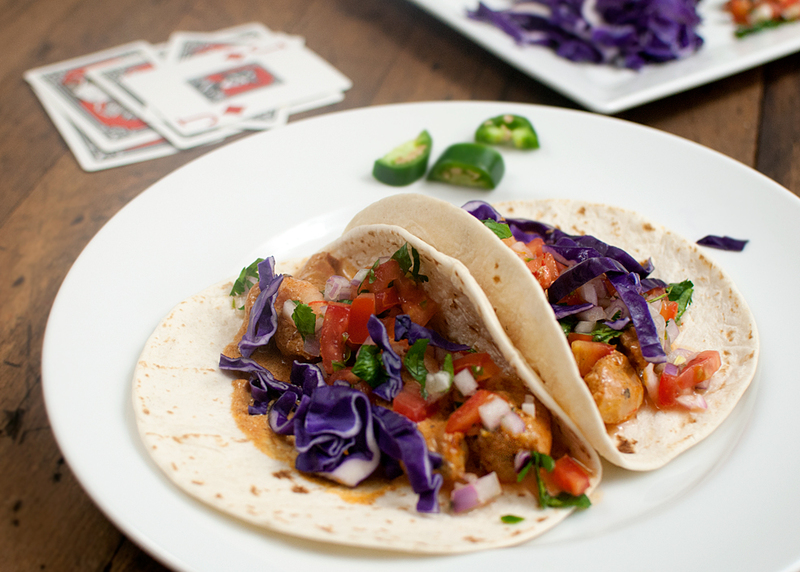 -Serve on warm tortillas topped with pico de gallo and shredded cabbage. This entry was posted in main dish, Posts and tagged chipotle, prawns, tacos. Sara of Peter, Michael & Sara Savage/Kaczkowski here. I love your blog! Where do you buy good Mexican supplies like “chipotle chilis packed in adobe sauce”? So happy to see your comment! There are a few Mexican markets up on Aurora now around about 80th on the left side if you’re going North, but for the chipotles, you should be able to find them at QFC in with the other Mexican foods. I got mine either there or at the PCC, so I know they’re not hard to find. There a small can, so may be hard to spot at first. Thanks for the question and I’ll be sure to add information about where to find unusual ingredients to future posts.